The Worldwide Developers Conference keynote was two hours long. You may have missed a few things. Apple’s Worldwide Developers Conference keynote on Monday morning was jam-packed with announcements, from all the features coming in iOS 10 to a new iPad coding app for kids. iOS 10 includes major upgrades to iMessage, Photos, Siri, Maps, and Apple Music, and a brand-new Home app to control all of your HomeKit devices. Check out all the announcements here. The iOS 10 developer beta is available now, with a public beta coming in July. Anyone can sign up to test the public beta for free, though beta software can be annoying and bug-ridden. Check out the beta sign-up details here. iOS 10 launches publicly in September. Goodbye, OS X. Hello, macOS. The next-generation Mac operating system has a new name, macOS Sierra, but most of the same great features, with some extras to boot—everything from Siri and Apple Pay integration to iCloud Drive desktop access and picture-in-picture (an iPad feature we love and can’t wait to use on the Mac). Like iOS 10, macOS Sierra officially rolls out in September, but developers can beta test the software starting now and a public beta launches next month. 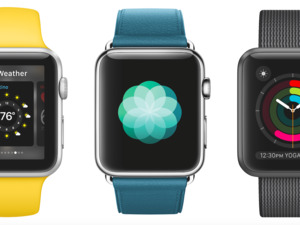 The Apple Watch was in desperate need of an upgrade, because everything about it is slooooow. It sounds like watchOS 3 will fix most of those speed issues, with an instant app launcher, background refresh, an app-switching dock, new fitness features like activity-sharing with friends and a meditative app called Breathe, and easier messaging thanks to a handwriting-to-text tool called Scribble. Apple even made the Apple Watch more accessible with fitness features for people who use wheelchairs, recognizing that some Apple Watch owners need settings that go beyond traditional workouts and stand notifications. Like iOS 10 and macOS Sierra, watchOS 3 is now available for developers to beta test, with a public launch this fall. No public beta will be available. Apple didn’t announce an unbundled live TV streaming service, but the Apple TV is getting a big update with tvOS 10. The biggest feature is single sign-in, so you can enter your cable subscription information one time instead of per app, but there are tons of improvements like live tune-in, dark mode, HomeKit control, and YouTube search. tvOS 10 is now available in developer beta and will roll out this fall to the public. No public beta will be available. The WWDC keynote was two hours long, so you may have missed some cool, smaller announcements. Here’s what else you need to know: Apple Pay is coming to the web. iCloud Drive will change how you store files on the Mac. There’s a new Home app for controlling your HomeKit appliances. Siri is opening up to third-party apps. Apple Music is getting a redesign and a Spotify-esque weekly discover mix. Apple wants to teach kids how to code with the iPad app Swift Playgrounds. In iOS 10, native apps can be deleted. Finally.